My brother just bought himself a new PC and I am helping him get everything ready for use. I already installed all the software (Office and AVG Free / NVIDIA Firewall already installed) + anti- malware programs (Ccleaner, Microsoft Windows Malicious Software Removal Tool, Ad-Aware SE, Spybot S&D, Microsoft Windows Defender and Spyware Blaster) and updated all the drivers. The PC connects to the internet via a Motorola SB5100 SURFboard Cable Modem (ISP: Amnet / amnet.co.cr) with an advertised speed of 512/128kbps. I already followed the suggested settings in Optimizing & Measuring the "Speed" of Internet Connection (ezlan.net) and dowloaded TCPOptimizer to maximize the connection's potential... however TCPOptmizer and CableNut (which I later installed) both failed to raise the Tcp RWIN value of 64240. I have used all the speed tests available and they all fell under the 256 to 375kbps range. hmm.. thats an awfully slow connection for cable. Normally, basic cable dsl packages start at 3000 down and 512 up. 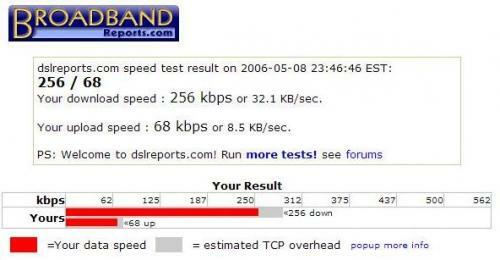 Your best bet there would be, one: Go to BroadBand Reports.com (formerly DSLresports.com) and register (its free) and run there test. Afterwards post the results of the test into a thread there and see what they can do for you. They are professionals there that are employed with the provider in which you have questions concerning. Two: Call the ISP yourself and try to get a tech to check the connection for you. Thanks for answering this thread so fast! I know you dont remember me, but you helped me a while back with the cable speed for my PC. I live in Costa Rica and the fastest (advertised) speed for residential use is actually 512kbps down and 128kbps up... I know its horrible compared to what you're accustomed in the States, but down here, its as good as it gets, sadly. When you helped me, we also used the Broadband tool and Dr. TCP (or was it TCP Optmizer?) to correct the settings of my Pebtium III (XP w/ SP2) and it worked out pretty well. I'm getting 90 - 95% of my advertised speed which isnt too shabby. The problem isnt my 'puter, its actually my brother's new PC: a AMD Athlon 64, 1800 MHz (XP w/ SP2 + nVIDIA nForce4 AMD Hammer Motherboard + 1024 MB RAM + nVIDIA nForce Network Adaptor). As a matter of fact, my brother uses the EXACT SAME ISP (same advertised speed of 512/128) and Motorola Cable Modem that I use; in fact, we brought the PC over to my house, and I hooked it up to my cable modem and where I usually get 500kbps on my somewhat crappy PIII, he barely gets half of that speed in his spanking new AMD Athlon 64!!! So I definitely know that its HIS PC configuration that's wrong. Edited by Al_graze, 10 May 2006 - 04:55 PM. Yes I remember helping you : ) XP's MTU defaults at like 1492 but RWIN you shouldnt havent problem with changing... hmm.. is he behind a router and/or have checked the modem settings? Hello again Crow, thanks for all the help! I was actually thinking that the nVIDIA (ActiveArmor) firewall could be the problem in the connection; I was reading this morning that it's still buggy. Maybe by disabling it, I'll fix the problem? There's only one small problem: since this hardware firewall is integrated directly with the device driver that controls the PC networking connection I don't know if disabling it would screw up the network. Most PC firewalls are software-based add-ons, but nVIDIA Firewall is the industry’s first true hardware-based PC firewall. And nVIDIA’s ActiveArmor secure networking solution, which consists of nVIDIA Firewall and the ActiveArmor engine, improves overall network security. Side Note: I always thought that you could have two firewalls running just as long as one was hardware and the other software (not two software firewalls running, though ), dunno, but I may be wrong. 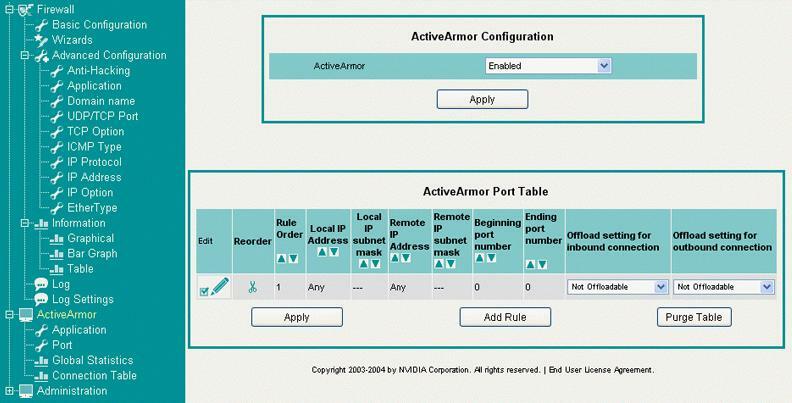 The question is, is this nVIDIA firewall (dubbed ActiveArmor) solely a hardware firewall, or is it a hardware and software firewall??? Edited by Al_graze, 11 May 2006 - 01:30 PM. The nVIDIA Hardware Firewall was definitely the culprit... disabled it and installed ZoneAlarm Pro and we're getting somewhat decent speeds now.... Thanks again, for all your help Crow... Take Care!